Occasionally, the culinary ideas that invade my mind are so fiercely absurd that they demand a test-run before I dare deem to serve them to anyone who isn’t a very close friend. And when I had the idea for Croffles & Volognese, I knew that it was just offbeat enough that it was necessary to arrange a test kitchen to see if it was tasty enough to serve for the Tuesday Team Luncheons at Ixds. I had been flirting with the idea of making a vegetarian bolognese. However, I have always been fiercely apprehensive to serve anything Italian to anyone who isn’t a close friend. My intimidation stems mostly from knowing that most everyone has an immense appreciation for Italian cuisine. This admiration for Italian food is especially evident in conversations with anyone who has ever traveled to Italy. I’ve had discussions with friends who had the good fortune to live in Italy that were as colorful, descriptive and passionate about its cuisine as ones had with Italians, who are understandably exuberant about the foods they’ve grown up with. Though I would never dare to claim that I make the best bolognese, I do enjoy my bolognese whenever I do make it. Moreover, I particularly love the act of cooking it. And it is those feelings of love of cooking my bolognese that I feel makes every mouthful of it a pleasure to eat. Because really, where else does that all of that love go if not into your food? It is undeniable that what makes bolognese so revered is it’s rich, meaty flavor, which leads me to one of the caveats of cooking for the team at Ixds — lunches for them need to be vegetarian; hence my playfulness calling it Volognese. Culinary playfulness aside, I want my modified vegetarian version of this Italian staple to be seriously tasty. So much so that I want even the most carnivorous of eaters not to recognize the absence of meat in what is essentially a meat sauce. The second part of my need for a test kitchen came chiefly from the desire to figure out what to serve alongside my hearty, vegetarian sauce. Typically, one might think to serve pasta with bolognese, though I wanted to challenge myself to think outside the (pasta) box. And while there is nothing wrong with a hearty bowl of soul-comforting pasta, sometimes, it can bring on drowsiness and fatigue, often turning my thinking and creativity into molasses, oozing slothfully for several hours after. For a split second, I had the idea of serving the bolognese with crispy polenta cakes. But, soon remembered I’d just recently served the team polenta cakes with smoky black beans, so that was out of the question. Zoodles? (Zucchini noodles, if you’re wondering.) Possibly. Zoodles are incredibly healthy, but they can make a watery mess in the bottom of a bowl once the heat from the bolognese hits the raw strands of zucchini, releasing the water within them, which is no disaster. However, watery bolognese and zoodles in the middle of winter doesn’t fill my head with thoughts of comfort; no thank you. Luckily, I stumbled upon Caroline Lange’s article on Food52, with the eye-catching title, “The Best Thing You Can Put in Your Waffle Maker Is Puff Pastry Dough.” If Caroline’s statement were a question, indeed my answer would be resounding and emphatic, “YAASSS!” (snaps, snaps!!!) 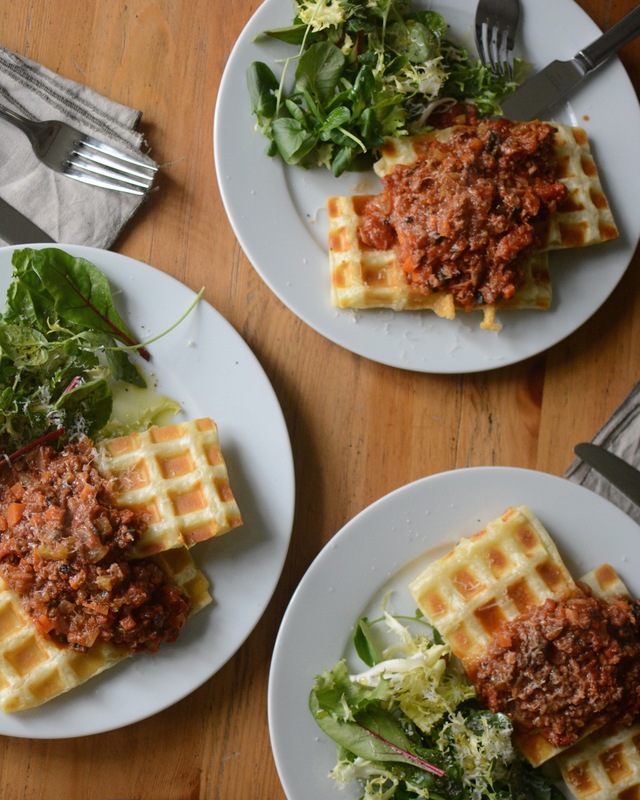 In the article, and accompanying video by KatieQ, she and KatieQ brilliantly suggested that store-bought puff pastry is put into a waffle iron to yield what is aptly known as the Croffle (Croissant + Waffle = Croffle). My immediately thought was “This. Needs. To. Happen.” Secondly, I hoped that the Croffle would be the perfect accompaniment to my bolognese. The results to the test-run were all positive. The bolognese, or rather, Volognese, left nothing to be desired in the way of meat. The Croffle was a huge success and was the perfect crunchy companion to the rich sauce. I’m certain that the team at Ixds will enjoy this as much as we did!